If you’ve had enough of “Mom, mom, mom, mom, mooooom!” this little trick is for you. We’ve all been there: You’re at the playground trying to chat with a fellow parent, when your kid unceremoniously interrupts the conversation because he wants to tell you something urgent about squirrels. Or superheroes. Or whatever else he’s thinking about. You discuss the rules of conversation, and he agrees to wait patiently for his turn to speak next time, but the excitement of his thoughts is overwhelming and he’s soon interrupting again. I’ve been in this boat for years. No matter how much we discussed it, my seven-year-old son just couldn’t help himself. It was like Pavlov’s dogs—the moment I got on a phone call, he needed to talk to me. So I asked my friend Cheryl Butler, a mother of 8 (eight!!) well-behaved, polite children and host of the Mighty Mommy podcast, for her advice. It’s a technique that avoids lengthy lectures and is based on cognitive behavioral therapy: After training your child to wait for you to finish what you’re doing, you’re rewarding him with your undivided attention. It seemed almost too simple to work, but I decided to try: The first few times, my son chafed against having to wait, bouncing up and down excitedly saying “Mom, Mom, Mom, but Mom, I need to tell you something.” I did my best to ignore him, even taking a few steps away to put some distance between us. Then after I was done, I turned toward him, crouched down to his level, and gave him my undivided attention, making sure to commend his patience. It took a few tries—Cheryl warned me that I’d have to stick with it—but within a few weeks there was almost no interruption. For the first time, I can actually finish an entire conversation with a friend before learning that fascinating fact about squirrels. This article was written by Motherly from Huffington Post and was legally licensed through the NewsCred publisher network. Please direct all licensing questions to legal@newscred.com. Truth: Your kids are just as sick of eating the same old turkey-and-cucumber sandwich as you are of making it. Win the Best Mom Ever award and pack some of these exciting but totally practical (read: neat, portable and edible at room temp) lunch-box goodies instead. BLT pasta salad FTW. Your kiddo will devour these healthy, colorful boats. Psst: Your little ones can totally help assemble these the night before. Don’t panic if your child chips, loosens or loses a tooth. But do allow a dentist to assess and repair the damage without delay, says pediatric dentist Trista Onesti, DDS. “A quick response can mean the difference between preserving and losing the tooth. And early tooth trauma can cause problems with adult teeth as your child grows,” Dr. Onesti says. If your child fractures or chips a tooth, call your dentist instead of the emergency department. Most dentists have an emergency hotline you can call when an accident occurs outside of operating hours. Acting quickly is important. When an adult tooth is knocked loose, a dentist will need to secure it quickly. He or she may need to secure the tooth with stabilizing wires or dental material as soon as possible. Contrary to popular belief, there are also important things to consider if a baby tooth is knocked loose. If your child loses an adult tooth, someone must re-insert it as soon as possible. Whoever is nearby — a parent or coach, for instance — should gently, but quickly clean the tooth and push it back into the socket. Many people don’t know that you have less than an hour to do this before the likelihood of saving the tooth long-term is jeopardized. Early tooth trauma can have long-term effects. Down the road, a child may have nerve damage that relates to early tooth trauma. “Sometimes the damage is immediately apparent, but other times it may develop over months or even years,” Dr. Onesti says. Trauma can provoke inflammation, which may damage the tooth’s root or nerve over time. If this continues, a root canal may be needed down the road; in some cases, it may even be necessary to extract the tooth. Therefore, it is important to inform your dentist of all previous traumatic incidents so he or she can evaluate with the necessary X-rays. 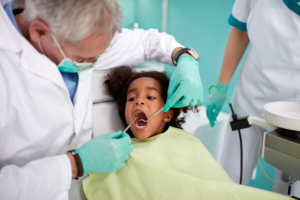 The bottom line: The best way to protect your child’s teeth — now and in the future — is to get him or her to the dentist as quickly as possible when tooth trauma occurs. Easy recipes to get your whole family eating well. Eating well should not be an unattainable fantasy for you and your family. These recipes from the Trim Healthy Table cookbook take the traditional meals you and your family already love, and make them healthier. They will help you reach your goal of staying fit as well as improve the overall well-being of your family. Never assume you are too busy to make health a priority. The tips and tricks in these meals make it simple, and help you take baby steps to living a healthier lifestyle. This is such a quick no-brainer for busy nights when you need dinner on the table in ten minutes. We enjoy this on dinner plates over a bunch of cut lettuce, but if you prefer you can stuff into low-carb tortillas. Heat a large skillet over medium-high heat and add the coconut oil. Add the peppers and onions, tossing frequently for a few minutes until they begin to soften. Add the chicken, sprinkle on the chili powder, onion powder, cumin, cayenne (if using), salt, and paprika, and toss with the veggies for a couple more minutes. Add the tomatoes. Cook for 2 to 3 more minutes. Serve on generous beds of lettuce and add toppings according to which fuel you decide on. Who wouldn’t love healthy Chinese takeout? Think Chinese takeout, but ultra-healthy and made in a jiffy! Here’s a time-saving tip—the night before, or the morning of, you can put the chicken in the marinade in a gallon-size baggie and refrigerate so it is all ready to go right before dinnertime. While you are at it, you may want to make double the amount of chicken and marinade. Put one of the bags in the freezer for a no-think, no-fuss dinner another night. Place the chicken pieces in a bowl and add 1⁄4 cup of the soy sauce, the ginger, onion powder, garlic powder, pepper, and vinegar. Allow to marinate for 10 minutes or so while you chop the vegetables (or do as described above and start marinating the night before or in the morning). Melt 2 tablespoons of the coconut oil in a large skillet over high heat. Once hot, add the marinated chicken. Allow the chicken to cook for a couple minutes on one side, then toss periodically in the hot oil for 3 to 4 more minutes or until just done. Transfer the chicken to a plate. Add the remaining 2 tablespoons coconut oil and all the veggies to the skillet. Add the remaining 2 tablespoons soy sauce and toss the veggies for 3 to 4 minutes, or until slightly wilted but still a bit crispy. Return the chicken to the pan, toss through and serve. Any recipe with ‘lazy’ in the title is bound to be perfect for busy weeknights. We gave you Lazy Lasagna, one of the most popular recipes in Trim Healthy Mama cookbook, but now we have an even lazier version. No baking time—just throw it all in your skillet, then scoop into your mouth. Kids love this, too, and it makes sure they get a good dose of healthy greens in their dinner! Brown the meat in a large skillet over medium-high heat, then drain off any excess fat. Add the pizza sauce, oregano, salt, onion powder, garlic powder, cayenne, and stevia powder (if using). Add the spinach (you may need to add half the spinach, stir until it wilts a little, then add the rest). Reduce the heat to medium-low and allow to simmer. Place the cream cheese and cottage cheese in a food processor and process until smooth. Add to the skillet. Allow all the ingredients to simmer a few more minutes, then you’re done. Top each plate with grated mozzarella. Carbs you can feel good about. Load your plate high with scrumptious noodles and slim down! Bet nobody has told you that before. Before you even have time to make a phone call for Chinese takeout, you can have this deliciousness ready for your table within 15 to 20 minutes. You’ll save time and you’ll save your waistline! We use two kinds of noodles in this dish for double the slimming power. It has konjac-based noodles, which are so fat-blasting and wonderful, and zucchini or yellow squash noodles, which we call “Troodles.” If you are not yet a fan of konjac-based noodles, you can use all Troodles, just double up on the zucchini. Melt the butter in a large skillet over medium-high heat. Add the garlic and toss in the butter for about a minute. Add the seasoning blend or chopped veggies and toss for another 2 to 3 minutes, or until softened. If using frozen veggies, toss on high. Add the Trim Healthy Noodles or Not Naughty Noodles to the pan, increase the heat to high, and stir with a fork as they cook. While they are cooking, add the nutritional yeast (if using), soy sauce, and red pepper flakes. Toss them over high heat for a couple minutes, then add the Troodles and allow to cook for few minutes, tossing well. At first you think there are too many Troodles … have faith, they will wilt. Make your life easier by preparing the sauce in advance. Your house will smell as wondrous as a Japanese restaurant when you make this. Watch your family wolf it down, never knowing there is a healthy secret ingredient in the sauce (so long as you don’t tell!). Prepare the sauce in advance. Put the chicken broth, okra, soy sauce, sweetener, and Gluccie in a blender and blend on high until completely broken down … we mean blend the daylights out of it so no bits of okra are left. Melt 1 tablespoon of the oil in a skillet over high heat. Season the chicken pieces with salt and pepper, add them to the skillet, and cook for 4 minutes, turning once. Remove them from the pan and set aside. Reduce the heat to medium. Add the remaining 1 tablespoon oil, the garlic and ginger. Toss in the oil for about 30 seconds, then stir in the frozen broccoli. Increase the heat to medium-high, cover, and cook for about 2 1⁄2 minutes. Stir in the mushrooms, cover, and cook for another 21⁄2 minutes (if using fresh broccoli, add later with the mushrooms and cook without covering for several minutes, tossing often). Uncover, pour in the sauce, and cook on high for 5 to 6 more minutes, returning the chicken for the last 3 minutes and adding the pepper flakes (if using). It’s all in the title of the recipe. When life gets chaotic, this meal can come to your rescue. Throw it in the crockpot in the morning and you’ll be able to breathe a sigh of relief knowing that supper is taken care of (or make it in a jiffy in your pressure cooker). This tasty chili is a no-brainer since it saves you a whole prep step. Most chili recipes that call for ground meat ask you to brown the meat and onions first, but we know life can be crazy busy and sometimes that just might be the 10 to 15 minutes you don’t have! We don’t want you giving in and considering picking up drive-thru food because you don’t have time to cook. So no more excuses—extra steps are outta here! Throw all the ingredients in your trusty crockpot and come back in the evening to deliciousness! Now, let’s say your life is extra crazy and you forget to prepare your crockpot meal in the morning but you don’t have an electric pressure cooker. No worries—this can be made in a pot on the stove in about 30 minutes—just brown your meat and onions, add all the other ingredients, and let it bubble away. Place the meat in the bottom of a crockpot and break up with a fork to spread around the bottom of the crock. Add all the other ingredients and mix well. Cover and cook on low for 5 to 7 hours. Once the chili is ready, break up any larger chunks of meat. ELECTRIC PRESSURE COOKER DIRECTIONS: Cook the meat on sauté mode, then add all the other ingredients. Seal and cook at low pressure for 10 minutes. Use the quick pressure release. Original Frank’s hot sauce tastes delicious on anything and everything. This is flavorful, hearty and so versatile! Please don’t be scared if you are not a spice lover. Just be sure to buy the original Frank’s hot sauce, not the “hot” kind. And if you’re still timid, pull back the amount of sauce to 1 or even 1⁄2 cup. That will give you a very mild heat level but still lots of flavor. Put the seasoning blend at the bottom of a slow cooker. Add all the other ingredients except for the sour cream. Cover and cook on low for 6 hours. Shred the chicken with 2 forks (it will fall apart easily). If using sour cream, stir it in well. ELECTRIC PRESSURE COOKER DIRECTIONS: Add all the ingredients except the sour cream to a pressure cooker. Seal and cook at high pressure for 12 minutes. Use natural pressure release for at least 10 minutes, followed by quick pressure release. Stir in the sour cream and shred the chicken. NOTE: When wrapping or stuffing this into lettuce or tortillas, use a slotted spoon or tongs to remove the chicken from the slow cooker and try not to get too much of the broth so it won’t be too messy. Bring Chipotle-style bowls to your kitchen table. We love Chipotle restaurants—so easy to stay on plan there using their bowl option. We love ordering their barbacoa beef or chicken, including the sautéed veggies, and putting it all over lettuce and salsa, then topping with lots of guac and a sprinkle of cheese. Mmmm … Amazing! Or sometimes we add some brown rice and beans. You can make something similar to their succulent beef (our very favorite menu item there) at home. Here is our version. Place the beef in the bottom of a slow cooker. Put all the other ingredients in a blender and blend well. Pour the contents of the blender over the beef. Cover and cook on low for 7 to 8 hours. Break the beef apart once cooked … you don’t have to completely shred, but pulling most of it apart allows it to drink up all the delicious juices. ELECTRIC PRESSURE COOKER DIRECTIONS: Coat the pressure cooker pot with coconut oil spray and place all the ingredients in the pot, including the blended sauce. Seal and cook at high pressure for 50 minutes. Use natural pressure release. Cheesy noodles without the fat. This is ooey-gooey, noodley, cheesy goodness. Regular white noodles when mixed with cheese are one of the most fattening and health-destroying foods on this planet. Konjac noodles, such as our Trim Healthy or Not Naughty noodles, allow you to enjoy that oh-so-magnificent combination of cheese and noodles without widening your waistline. Snip the noodles a bit smaller with kitchen scissors so they are not too terribly long. Put the diced chicken, noodles, and diced tomatoes and chilies in a 9 × 13-inch baking dish. Put the cream cheese, broth, salt, pepper, paprika, chili powder, onion powder, and garlic powder in a blender and blend until smooth. Scrape the mixture into the baking dish using a spatula. Mix in 2 cups of the cheddar. Top with the remaining cheddar and bake for 30 to 35 minutes. Broil for just a couple minutes at the end to make sure all the cheese is golden brown and bubbling, but watch it doesn’t burn. An inexpensive way to try something new with your family. This is a quick and easy way to include more fish in your life. There is only so much chicken and red meat you can eat, so please make room for fish! It is a wonderful, slimming part of a balanced-protein approach. This recipe is incredibly flaky and full of flavor, and it’s a great way to get your children to start liking fish. It need not be expensive, either. You can buy 2 pounds of frozen tilapia fillets from any landlocked grocery store inexpensively and thaw them before cooking. If you don’t like the idea of using tilapia, use any other thin white fish of your liking. Preheat the oven to a high broil. Rinse the fish and pat it dry. Place it in a single layer (no overlap) in an extra-large baking dish or 2 medium baking dishes. Pour the melted butter over the top and turn each fillet in the butter to coat well on both sides. Sprinkle lightly with black pepper and pepper flakes (if using). Combine the Parmesan, mayo, yogurt, and dill in a bowl and stir until a paste forms. Set aside. Put the fish on the second rack from the top of the oven and broil for 3 minutes. Remove from the oven, turn each piece over, and smear with some Parmesan paste to cover the top of the fish (easily done with a fork). Broil for another 4 to 5 minutes, until it’s bubbling and golden brown on the top and flaky in the middle. This article was written by Serene Allison and Pearl Barrett from Working Mother and was legally licensed through the NewsCred publisher network. Please direct all licensing questions to legal@newscred.com. School is on hiatus ‘til fall, which means you’ve got approximately 10 weeks to keep the youngest members of your household happily entertained. Don’t worry, we’ve got your back with this epic list of the coolest activities for kids of all ages in every single state. This museum in Huntsville has the largest collection of rockets and space memorabilia anywhere in the world. It also has super-cool simulators like the space shot (kids can rocket 140 feet straight up in less than 2.5 seconds) and the G-force accelerator (so kids can experience three times the force of gravity). This stroller-accessible hike in Anchorage is just one mile in length and—barring a few steep spots—is very family-friendly. Plus, the pay-off is huge: At the end of the trail is a dramatic, 200-foot waterfall that will leave your kids in complete awe of a different mom: Mother Nature. For kids ages eight and up, the Tonto National Forest (dubbed a “mini Grand Canyon”) is a sight to be seen, especially from the water. Pack a lunch and relax as you float down the refreshing mountain water stream. In addition to an indoor, three-story Dinosaur mountain with a simulated flash flood, there’s air conditioning at this Mesa museum—a win-win for the dino-lover in your fam. Did we mention Arizona is hot during the summertime? Wet ‘n Wild is the ultimate cool-off zone, complete with epic water slides, a lazy river and more. Home to minor league baseball team the Northwest Arkansas Naturals, this Springdale ballpark brings over 70 home games—not to mention festivals, fairs and family fun days—for kids to enjoy all season long. Some parts of these caves, located in the Ozark-St. Francis National Forest, took shape over 350 million years ago. Your kids will love peeping the rock formations (and tiny cave creatures like salamanders) as they tour the area. Bonus: The underground temp stays at a cool 58 degrees, perfect for summer. This 450+ acre park in Eureka Springs is home to over 100 abused, neglected and abandoned big cats—bobcats, ligers, cougars and leopards included. This 1,800-acre wildlife refuge operates next to and in partnership with the San Diego Zoo (another places worth visiting if you have time), but it’s the only spot where you can see animals ranging from cheetahs to lions to zebras roam free, from a safari tour. A national landmark since 1864, there’s no end to the kid adventures—including getting sworn in as junior rangers—that can be had within the park’s 1,200 square miles of valleys, meadows, wilderness and more. Just be sure to plan your visit (and book a campsite) in advance. This popular park in Colorado Springs features breathtaking geological formations, plus rock climbing and nature trails. Just keep in mind that for summer, there’s not a ton of shade. Visiting Santa in July feels like a misnomer, but it’s actually the perfect time of year for a Christmas-centric theme park filled with a range of outdoor rides. And, hey, if you happen to get a pic with Santa at this Cascade hotspot (located 20 minutes from Colorado Springs), you can nail down your holiday card four months in advance. Located in Estes Park, this campground—named after cartoon character Yogi Bear—is right in the heart of the Colorado Rockies. And while your kids can get their fill of nature, there’s also lots of other activities on site including a heated pool, mini golf, a game room and more. In addition to beluga whales, African penguins and sharks, a special exhibit on dinosaurs—featuring 12 animatronic creatures—just recently opened. Speaking of throwbacks, your kids will love the thrill of seeing a movie outdoors from the comfort of your car. The summer lineup was just released with films ranging from The Sandlot to The Princess Bride. This free museum at Dover Air Force Base showcases some of the U.S. Air Force’s largest (and no-longer-in-use) aircrafts. Watch your kids lose their minds as they get to the know the ins and outs of aerodynamics while walking all around these massive planes. This museum/library/garden is home to one of the biggest collections of Americana in the U.S. It also features 1,000 kid-friendly acres of outdoor space including an area called the “Enchanted Woods,” which gives kids an opportunity to explore the world of fairies with attractions like the Troll’s Bridge. Known as one of the top beaches in the country, this shoreline features more than just sun and sand. Along the boardwalk, there’s bumper boats, a water slide, lazy river and more. Ten bucks says your kids will be more thrilled by the Monorail than the actual rides. This Paradise Beach theme park puts water activities at the forefront. But it’s not just for the older kids: The Family Fun Zone includes a wave pool with “wiggle waves” and mini water slides. Located on Jekyll Island, this education center is focused on the rehabilitation of sea turtles in the wild. Oh, and there are also alligators. It’s the world’s largest aquarium (located in Atlanta) with over ten million gallons of water and one hundred thousand animals on site—whales, jellyfish and puffins galore. This 42-acre zoo features tons of species indigenous to Hawaii, like the short-eared owl and the Hawaiian goose. It also features twilight tours (perfect for older kids). This Kauai-based beach in the city of Kapaa is a local favorite and features two enclosed swimming areas, both protected by boulders, so it’s easy for your kids to safely splash about. It’s also right across the street from the Kamalani Playground, should they need to blow off a little steam. This amusement park in Athol is home to the first-ever inverting roller coaster (FYI, kids need to be 48 inches tall to ride), but it’s also got a lazy river, carousel and ferris wheel. As long as the temps aren’t too hot, let your kids run—and surf—the sand dunes at this state park and campground, located just 45 minutes outside of Boise. It’s home to the 2018 World Series-winning Chicago Cubs. What better time than summer to take your kiddos to a game? Fun fact: Superman’s hometown is Metropolis, Illinois. That’s why your comic book-loving little one will relish a visit to this museum featuring over 20,000 items tied to the Man of Steel’s history and fictional life. It’s one of the largest science museums in the world. Even though school is out for summer, take your kid to this Chicago institution where they can learn all about Planet Earth, robots and more. It’s the world’s largest kids’ museum and it also has a pretty cool selection of summer exhibits on display, from the Fireworks of Glass to a look at American Pop. This interactive history park in Fishers (about 30 minutes north of Indianapolis) is all about exploring science, history and nature in a hands-on way. This throwback parlor is an activity all in itself thanks to the rooms stocked to the brim with memorabilia. Also, your kids haven’t lived until they’ve tried a classic ice cream soda. This museum-meets aquarium-meets science center in Dubuque is a place where your kids can learn and touch. There’s also a 4D theater with plenty of child-friendly special effects (think: wind, mist and seat movement). Introduce your kids to the movie, then plan a day trip to the museum—located about 45 minutes east of Topeka—which features artifacts, history, folk art and collectibles. Teach your kids where their food comes from with a tour around this farm in Overland Park, complete with lesons in growing veggies, bottle-feeding baby goats and milking cows. Your kids will love the chance to tunnel 650 feet below the Earth’s surface and touch actual remnants of the inland ocean. Then, when they’re done, they can ride the Salt Mine Express underground railroad at this Hutchinson spot, just outside of Topeka. The official spot where MLB bats get made, this museum also boasts a 120-foot to-scale replica of the actual bat swung by Babe Ruth. Oh, and there’s a tribute to the 25th anniversary of The Sandlot currently on display. It’s the world’s longest known cave system with over 400 miles waiting for kids to explore. Beyond touring the complex labyrinths, you can go for a family canoe ride, picnic, horseback ride and more. Not only can kids hold and feed gators at this Greenwood zoo, located 20 minutes from Shreveport, they can zip line over many of the residents—camels, kangaroos and miniature horses. They may be too young to really laissez les bons temps rouler, but that doesn’t mean they can’t get in on the action. At this enormous NOLA warehouse, kids can tour the masks, floats and other Mardi Gras ephemera, and even play dress-up in the big costume closet. It’s hard to beat a minor league baseball game in the heart of Portland. Take your kids to a double-header (and make sure they get a pic with the mascot Slugger). Sign your kids up for the summer-only Junior Ranger Program, where they earn a badges for scouting things like seals, porpoises and birds. Sure, during winter, this place is ski central, but during summer your kids can participate in guided moose tours, go mountain biking, zip lining and more. One of the best spots in the state (it’s located in Woodbine) to pick your own cherries or blueberries—an easy summertime kid activity, plus a built-in snack. It’s not summer in New England without taking in a Red Sox game. Plan ahead and schedule a 50-minute tour of the ballpark—a historic landmark—before the first pitch is thrown. In the winter, it’s an ice rink, but come summer, this man-made “pond” in the middle of Boston Common becomes a popular wading pool for tots looking to cool off. It’s been over 100 years since the Ford Motor Company introduced the Model T. Take your kids to the Dearborn museum where they can learn all about the innovation and spirit of it’s creator, Henry Ford—oh, and actually ride in a restored car. Experience the science of flight at this aviation museum in Portage (near Kalamazoo) that combines rare aircraft with flight simulators and bi-planes (what the Wright Brothers flew) which your kids can actually steer. It takes place every July in Traverse City. Sign your kids up for the cherry pie eating contest, then stay for the evening fireworks display. Give your kids the chance to catch a rare sighting of an American Bald Eagle up close, but also in the wild at this nonprofit located in Wabasha. Canoe between the cliffs, crags and canyons of this epic route, located in the northern third of the Superior National Forest. Forget about shopping — this indoor amusement park at America’s largest mall (in Bloomington) features games, water rides, an aquarium, and an adventure course. Enough with Lightening McQueen. Take your little guy to see over 100 antique automobiles, all displayed and laid out to illustrate the history of car design and engineering. Dolphin encounters abound at this research institution in Gulfport near Mississippi City, the perfect spot for your kids to learn about the humane animal treatment and conservation efforts of this aquatic creature. Your kids will relish the chance to see first-hand what an international space station set-up looks like at this Pearlington-based site. The motion and cockpit simulators are another crowd pleaser. And for older ones, so is the bus tour of a NASA rocket-testing facility. The Lego-lover in your household will go nuts at this Lego “experience” in Kansas City, complete with a Lego master builder academy and Lego ideas studio. This water park in Linn Creek is the place to cool off come summer with food, rides and slides—not to mention a lazy river for younger kids who just want to float and chill. Pitch a tent or rent a cabin at this park in Middle Brook (90 minutes south of St. Louis), which is filled with natural swimming areas, hiking trails and spots to roast s’mores, away from it all. It’s the largest natural freshwater lake in the U.S. (with an entry point in Lakeside), which means there’s plenty of room for tubing, canoeing and swimming. Prepare your kids ahead of time: There will almost definitely be a line wrapping around the block just to get a scoop (or two) of ice cream at this Missoula spot, famous for their homemade flavors like cardamom and huckleberry. Home to the largest collection of dinosaur fossils, this museum in Bozeman will pique your kid’s curiosity in the prehistoric creatures and give them a chance to play paleontologist for the day. Over 30 million years ago, a river actually flowed through this area in the Panhandle now filled with remnants in the form of bulky sandstone blocks. Send your kids on a scavenger hunt for imprints left behind by now-extinct animals including saber-toothed cats and rhinos. Pack lunch for the family and float down the scenic Cedar River in an apparatus designed for water-lovers: An eight-foot plastic stock tank with a picnic table built in. Quite seriously, this state park in Overton might be one of the coolest campgrounds your kids have ever seen. It features over 40,000 acres of bright red Aztec Sandstone, perfect for daytime hikes. There’s a rotating climbing wall, train simulation and airplane teeter totter, all at this popular museum in Carson City. You don’t have to stay at the Mirage hotel to book tickets to this unique Vegas experience: A chance for kids to come face-to-face with dolphins, white tigers, white lions and leopards. Come summer, this Lincoln theme park’s main focus is family fun—take your kids to the black bear show (with actual bears), ride a steam train or cool off on the water blaster boats. Even if all you do is grab an ice cream cone at Stillwell’s Surfside Scoop and walk the boardwalk, your kids will be happily entertained. Get this: At this North Jersey spot, Your kids get to dress up as pirates and learn pirate lingo before setting sail on an action-packed, hour and 15-minute adventure that has them following a treasure map to their booty. Go for the beachcombing, stay for the mini golf. Located on the southern tip of New Jersey, it’s a go-to spot for families looking to escape the heat without the Jersey shore riff-raff. Expose your kids to farming as it was done 100 years ago and enlist them to help with daily tasks like collecting eggs, grinding corn, feeding chickens and cleaning a horse’s harness at this working farm in Morristown. Every July, this festival draws kids and adults from all over the country for live entertainment, a costume contest, parade—and *fingers crossed* an alien sighting. Get ready for a massive collection of dinosaur fossils, to-scale whales and a hall of American mammals (all stuffed) at this famed Manhattan museum. Just don’t forget a stop at the planetarium before you depart. This 13-day showcase—featuring food, music, carnival rides and oh-so-many butter sculptures—takes place in Syracuse between August 22 and September 3. Hello, summer send-off. The planetarium here in Chapel Hill was once used to train real live NASA astronauts, a fact worth dropping on your kids right as a show like the Solar System Odyssey (a crowd favorite) is about to begin. Home to over 750 animals from six different continents, this “farm” in Mooresville showcases everything from wild mustangs to antelope. Save the date for this annual Beaufort event—held this year on August 10 and 11—where people come from all over to reenact the pirate heritage of the area. Your kids will love the treasure hunting, sword fighting and cannon firing, all a spectacle worth seeing. Instead of playing the alphabet game, pile the kids into the car and drive this 32-mile stretch of roadway enlisting them to help spot the fancy (and whimsical) metal sculptures dotting the landscape. Fishing is a beloved pastime for anyone here. Introduce your kids to it where they’re certain to catch something—at Devil’s Lake, the largest natural water body in the state. A summertime tradition, this outdoor cowboy cookout combines all the thrills of the wild west. After dinner, stay for the Medora Musical, a western-style variety show set against the backdrop of the Dakota Badlands. In addition to the usual suspects—lions, tigers and bears—your kids will get to see the likes of the American bison and African Gray parrot while on a Congo expedition (aka a super-cool guided tour). The ideal spot to take the car-lover in your fam, this race track offers plenty of spectator experiences (in addition to actual races) featuring vintage automobiles, rugged trucks, motorcyles and more. In addition to riding the vintage carousel and replica transcontinental locomotive, kids can zipline across this farm in Oklahoma City to take in the views from above. Your kids will never forget the summer they got to hold (and feed) baby tigers at this “zoo” in Tuttle, complete with actual safari tours. This annual kite festival held every June is not to be missed—but if you pop by the beaches in the area on, say, a random Tuesday, the chances are still good that you’ll see plenty of families testing the wind with their own kite, bought at local favorite Catch the Wind Kite Shop. This 64-acre zoo in Portland will entertain your kids all afternoon. Then, if you can swing it, stick around for the evening concert series—a summer-only event. Bring on the Elmo freaks: This theme park an hour outside of Philadelphia includes rides, water attractions and live entertainment and is a great bet for littler guys who might get overwhelmed by bigger amusement parks. Kids see first-hand how crayons get made at this Easton warehouse, just an hour and a half north of Philly. Then, when they’re done, they can take home a souvenir set named after themselves. There are 14 roller coasters and a zoo at this epic amusement park that also offers ample opportunities to taste-test chocolate. Summer is the best time to nab a good deal at this indoor trampoline park located in East Providence. Another minor league team worth checking out. Keep in mind, if you go on a Saturday night, there will be be post-game fireworks, win or lose. This time of year, Food Truck Fridays are all the rage at this popular 40-acre zoo in Providence, one of the oldest in the country. There are locations all over the state for this amusement park, known for its arcade games, rides and—soon to be your kid’s favorite—a go-kart race track. Located in North Myrtle Beach, it’s one of the largest facilities for reptile life in the U.S. After watching a live feeding, your kids can pose alligator-related questions to the staff veterinarian, aptly nicknamed “the croc doc”. This working vintage steam train in Hill City will captivate your child—and you—as you take it on a historic route through the state’s most famed gold-panning spots. Get this: An actual sink hole in Hot Springs uncovered a treasure trove of fossils—including woolly mammoths—from the ice age. Your kids will go berserk. Impress your kids with this 50-acre complex in Union City, complete with a 20,000-gallon aquarium, an actual earthquake simulator and train station. There’s a shark touch pool at this Chattanooga spot, not to mention three living forests, a 3D IMAX theater and more. This “moving” museum in Chattanooga offers experiences (most under an hour in length) that will give your kids the chance to understand railroad travel as it was in the past. A throwback to the old west, your kids can enjoy horseback rides, eat out of a chuckwagon and learn all about cowboy culture when they visit this theme park in Boerne. This Dallas-based aquarium has a rainforest vibe, but also plenty of endangered species like Orinoco crocodiles. There’s even an underwater tunnel where sharks swim over your head. Arm your kids with the tools they need (binoculars, a magnifying glass, an animal tracking key—all available on site), then embark on a family mission to locate prehistoric dino tracks, at this state park in Glen Rose. The former site of the 2002 Winter Games, this Park City spot has tons of summer-themed activities, like zip lining, extreme tubing and water polo. With over 2,000 natural sandstone arches, this national park located just north of Moab is great for your natural-born climber. There are over 100 life-like dinosaur sculptures at this eight-acre outdoor park in Ogden—go on a scheduled tour or roam free (like the dinos did). This Waterbury spot is where the famous pints (Cherry Garcia, anyone?) get made. Take your kids on a 30-minute tour and treat them to a scoop—or two—at the end. The best place to help your kids learn about a more sustainable future, this farm in Shelburne (a suburb of Burlington) offers hands-on educational experiences like brushing sheep and milking goats. Plan ahead for lunch at Smugglers’ Notch Picnic Area (located in a narrow pass through the Green Mountains) then stroll along the wetlands boardwalk all afternoon. A tour at these caverns, located west of Richmond, takes just 45 minutes, but on it, you and your family can descend more than 34 stories deep within the earth. Kids have to be 10 or older, but once they are, they’ll absolutely love traversing this treetop obstacle course in Williamsburg that offers Tarzan swings and a ropes course. It’s pick your own blueberries at this well-known farm in New Salisbury, which also has a petting zoo and playground. Home to about 250 displaced wolves, this spot in Tenino, just south of Olympia, is designed with kids in mind: There’s a 50-minute tour designed to remove the storybook stigma and a chance to glimpse these beautiful creatures up close. It’s the largest air and space museum in the world (located in Seattle)—and also your kid’s chance to hop in a flight simulator and play pilot for the day. It’s not summer without a trip to the ballpark—this minor league team (which plays its games in Granville) is all kinds of nostalgic. The ultimate way to cool off in the summer is a guided (and family-friendly) white water rafting tour, which takes off from Harper’s Ferry. This Sheboygan botanic garden (located midway between Milwaukee and Green Bay) is inspired by your kid’s favorite children’s books and uses imaginative landscaping skills to bring classics like Harold and the Purple Crayon and Goldilocks and the Three Bears to life. Total day trip material, this experiential center in Warrens (outside of Madison) will teach your kids everything they need to know about the cranberry industry…and the history of the state fruit. While there’s no limit to the range of activities your kids can enjoy at this museum, we’re partial to the inventive city of Possible-opolis which is filled with interactive puzzles, games and a giant gerbil wheel. This Cody-based ranch is the perfect place for your kids to experience cowboy life and learn all about the Yellowstone ecosystem. The kids program (aimed at children six and older) even offers the chance to saddle up. It’s one of the largest dog sled kennels in North America (and located in Dubois). Sign up the family for a one hour tour. Plan to BYO lunch and picnic by the all-natural mineral hot springs while actual bison roam nearby. There’s even a free bath house if your kids want to dip their toe in the water. Your kids will flip walking around this working facility on the National Mall where actual U.S. dollars get printed. There’s a film and gallery tour, but you can also head straight to the production floor for a clear view of all the cash. There are more than 2,000 animals to spot at this free zoo, but after your little ones are done keeping a distance from the gorillas and lions and bears, they’ll love visiting the kid’s farm for a chance to meet and greet cows, alpacas and donkeys.